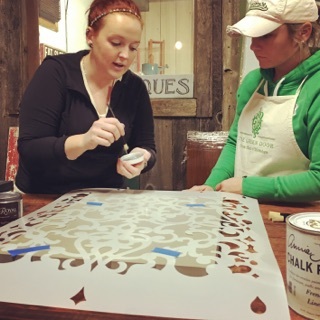 Stencils will give those old canvas paintings a new life! Everyone has one; those old canvas prints you get over the years that when it comes to changing up your home décor just get tossed out because you are over the look. Even the canvas paintings everyone is doing at Paint Nights are getting tossed out or appear in yard sales. Well listen up… don’t get rid of them! Give them a new look! 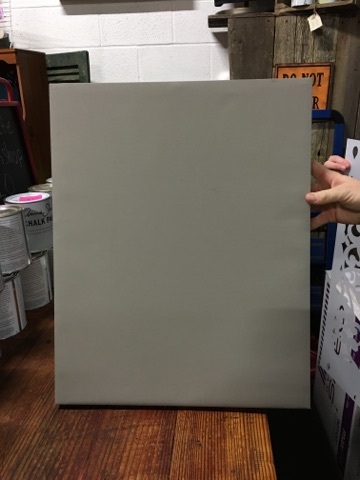 Bring that old, ugly, outdated canvas back to life and reuse it somewhere! How? With stencils and a little creativity! Go ahead- make it happen, that’s exactly what we did, well that’s exactly what Kate and Danielle did at the shop! 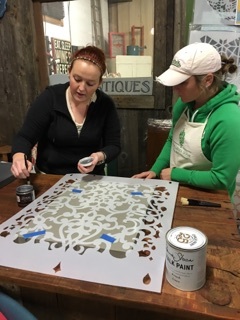 Danielle took an old canvas print that needed some up dating and painted one coat of French Linen Chalk Paint® by Annie Sloan. She contemplated many ideas, stalked Pinterest and consulted her friend Kate at the shop knowing she would know just what to do! 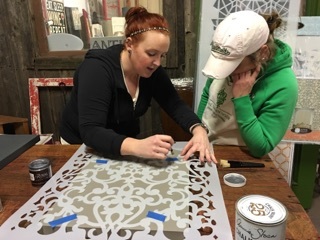 After looking through all of the very cool stencils we have at the shop, Danielle found her winner! This is a massive stencil; one that would look awesome on a wall, a fun piece of furniture and now on an old, drab canvas! 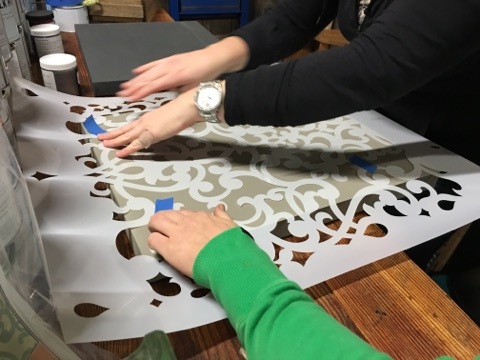 We used painters tape to tape the stencil to the canvas; this makes it easier to manage and help ensure there is little movement while we are stenciling. 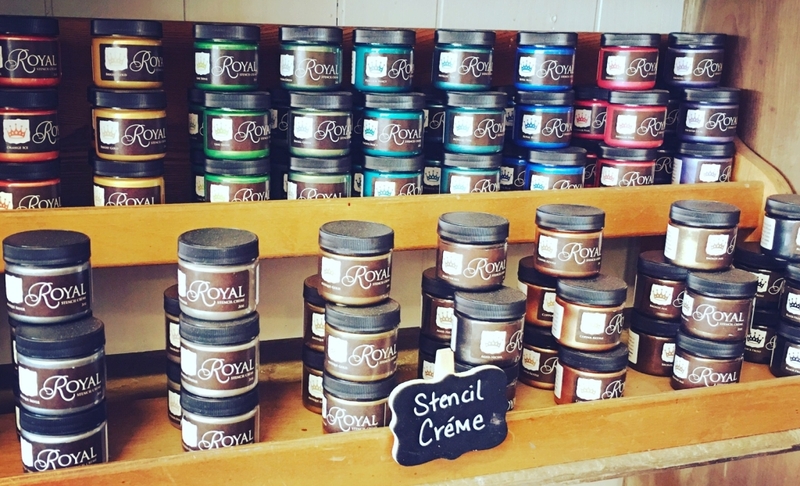 We stock Royal Stencil Crème in all of their gorgeous metallic colors so it took a few minutes to choose just the perfect color! 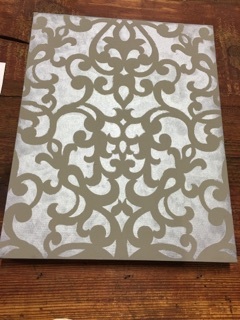 Antique Silver is gorgeous and thought it would pop on French Linen Chalk Paint®! Here we go!!!! Now remember, your masterpiece is only as good as the products and tools you use. 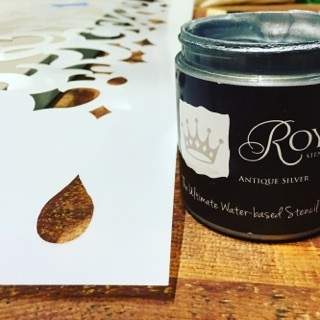 Make sure to pick up a Royal Designs stencil brush (they come in all sizes) for your next stencil project! You only need a little bit of stencil crème so try not to overload your stencil brush. A little tip: the cap will generally have a lot of paint so don’t be afraid to grab some of that to get you started. 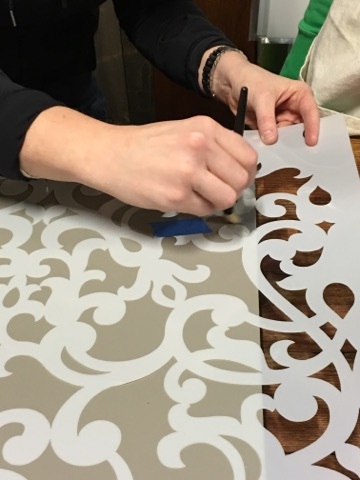 Kate is the master of stenciling here at the shop; she is a great resource for color selection, pattern, good tips and tons of ideas! Try brushing in a circular motion while pressing firmly. Remember to hold the stencil down to prevent the crème from bleeding underneath. The painters tape will only hold so much! After a few quick tips from Kate, Danielle is well on her way! The finished masterpiece is hanging in the shop near the paint bar for all to see! 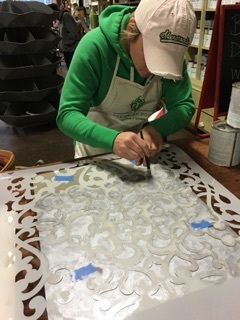 2015 Wreath Making Workshop – What a success! Thanks for a Wonderful 2015! I Joined the Happy Crowd! Mr WordPress on I Joined the Happy Crowd!